Two hundred and twenty-seven years after the Treaty of Paris concluded the American Revolution, you’ll still see signs for General George Washington’s headquarters if you travel west from Newark, New Jersey, and New York City. You might expect a small cabin or farmhouse, but the signs point toward a mansion. 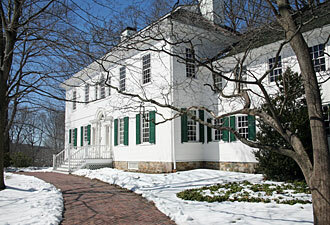 This beautiful 18th-century home served as the 1779-1780 headquarters of General Washington. Just a short stroll down a hill, you can meet a ranger for a tour of the mansion, or you can explore the Washington’s Headquarters Museum. In spite of the museum’s name, the collection goes far beyond George Washington memorabilia. One room houses weapons of the Revolutionary War—bulky and large, yet soldiers walked miles with them. Across the hall is a collection of a completely different nature. Ornate clothing, fine china, a homemade quilt, and a painting of Washington bespeak the finer aspects of family life rather than the ardors of military service. One more room shouldn’t be missed. In it, you can see examples of writings and pamphlets from the Revolutionary era and even a copy of Washington’s last will and testament. Travel through the Town of Morristown, and you can’t miss the town square, the Morristown Green. 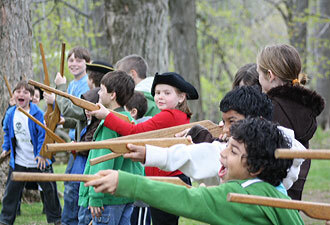 It calls to mind a quaint Southern settlement rather than an army encampment. The closer you draw to the Jockey Hollow encampment area, the more lush and green everything appears. It’s hard to imagine that most of the original massive trees were cut down to provide temporary homes for at least 10,000 troops. Once you enter Jockey Hollow, big cities are far, far away. The sounds of cars and planes give way to those of birds and rustling trees. Rangers in the visitor center welcome you and suggest where to start your adventure. Check out the soldier hut, a reproduction meant to show what the army barracks of yesteryear looked like – not so cozy. A film tells the story of the troops who struggled and sacrificed to secure American independence. 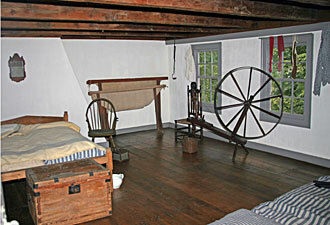 Behind the visitor center sits the home of Henry Wick, a farmer who owned the land during the big 1779-1780 encampment. A ranger in period dress knits, cooks, and talks about the Wick family’s experiences around the soldiers and the effects that General St. Clair’s stay in the home had on the family. Exploring in and around the house, you can see the extensive variety of herbs and plants that the Wicks used. Tall corn plants, which supplied materials for brooms, and even marshmallow plants populate the diverse and colorful landscape. Just a short walk up the road, you are greeted by the curious site of soldier huts standing on the hill. Five huts in total, these replicas allow additional exploration of a soldier’s life. Although the mossy walls and smells of stale fire are natural and comforting, the huts are probably not places where you would want to live for several months. The miles of trails through Jockey Hollow allow an escape from everything. You can wander without seeing or hearing anyone—a surreal experience for urban and suburban visitors. Small springs and streams provide enough moisture under the massive canopy for a wide variety of mushrooms and amphibians to thrive. Bullfrogs burp at each other, and the woods surround you, all while you remain remarkably close to the visitor center.